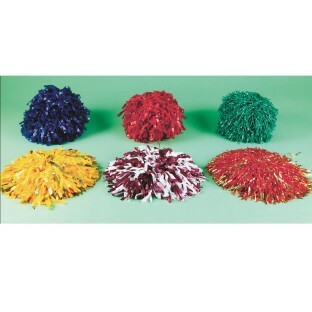 High-quality plastic poms for your cheerleading activities, spirit or dance groups. 1/2" width pom with baton handle, a strand length of 7" and a strand count of 1,536. Strand lengths and counts are approximate. Colors may vary, due to various dye lots. Please consider this when attempting to match older poms. High-quality plastic poms for all your cheerleading activities, spirit or dance groups. 1/2" width pom with baton handle, a strand length of 7" and a strand count of 1,536. Strand lengths and counts are approximate. Colors may vary, due to various dye lots. Please consider this when attempting to match older poms. Four pom minimum per order. Poms are priced individually - not in pairs.